You may have heard a lot these days about people who hoard copper pennies and wonder why they are. After all, if you’re like most coin collectors, you probably know that silver coins have historically been the big pocket change prize. However, the times they are a-changing, and the value of copper has skyrocketed over the past few years. People are beginning to hoard copper pennies in the opportunistic pursuit of someday cashing in on the coins’ intrinsic value. 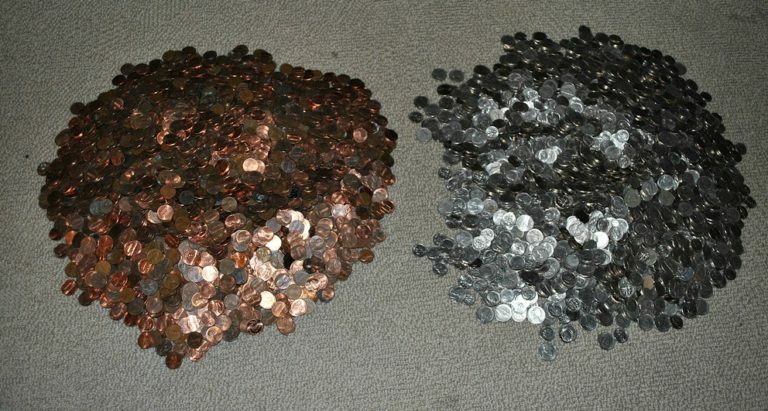 In general, all pennies made before 1982 have a composition of 95% copper and 5% tin and zinc – with the exception that during some of those years, there was no tin in the alloy. Also, there was the steel 1943 Lincoln cent (and 1944 steel pennies, which were made in error). Those coins are a topic for another post, though! During the year 1982, the U.S. Mint switched the composition of pennies to copper-plated zinc to avoid the rising cost of producing copper pennies. As a result, some pennies made in 1982 are made from copper and others from that year were produced with the current mixture of 97.5% zinc and 2.5% copper. Pennies that weigh approximately 3.11 grams are copper. One-cent coins that weigh about 2.5 grams are zinc. If you want to hoard copper pennies, the best way to do so is to buy rolls of one-cent coins from your bank and check each roll for pennies made from 1982 or before. You can automatically assume all pennies dated 1981 or before are copper. Those dated 1982 can be weighed to determine which are made from copper and which are primarily composed from zinc. 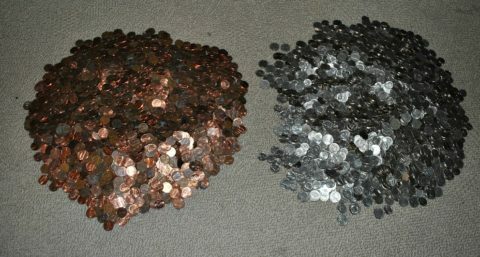 Re-roll the unwanted zinc pennies and trade these in to search through more penny rolls. If you’re hoping to get a quick payout on all the copper pennies you’re saving, you might want to hold on – U.S. law prohibits the melting of one-cent coins. Hoping to get around the law by sneaking your coins out of the country? Think again – you can’t transport more than $5 in pennies out of the U.S. It would only potentially become legal to melt one-cent coins in the United States if legislation passes that ends the production of the penny. But Congress has entertained the elimination of the penny several times, but has yet to actually pass a bill that stops production of the lowly penny. For the record, Canada stopped making pennies in 2012 because, as is the case in the United States, the purchasing power of a one-cent coin has been eroded by inflation, and the coin costs more to manufacture than it is actually worth in face value. So why all the fuss about saving copper pennies if you can’t melt them down for cash yet? Coin hoarders insist that their efforts in saving copper pennies now will be worth it when the time comes that they can legally melt their pennies. Many of these individuals are already selling their copper penny troves to other hoarders for $1 or more per roll of 50 pennies.